Today 5th October 2017 Intel launches the new 8th generation core I series processors with the new Z370 chipset. As the CPU competition heats up, there’s never been a better time to buy or upgrade, with an unprecedented range of power and performance options to choose from. ASRock understands that many users are looking to a new Z370 motherboard to provide extreme performance, maximum overclocking ability, and limitless expandability. ASRock promises to deliver all that, and more. Supporting the latest peripherals, accessories and mobile devices, ASRock’s high-end motherboards – such as the Fatal1ty Z370 Professional Gaming i7 and Taichi – provide a USB3.1 Gen2 Type-C header to ensure the most powerful and versatile USB connection can be easily accessible at the front of the PC case. 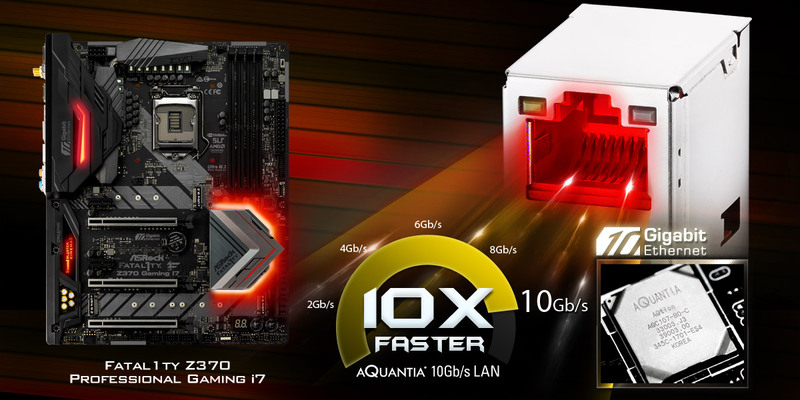 And not only that, the flagship Fatal1ty Z370 Professional Gaming i7 accelerates gaming, SOHO and home office usage, by providing the latest AQUANTIA AQtion™ 10Gb/s super-fast Ethernet on board. ASRock’s Killer SLI series motherboard has always been the best choice for budget multi GPU setups. 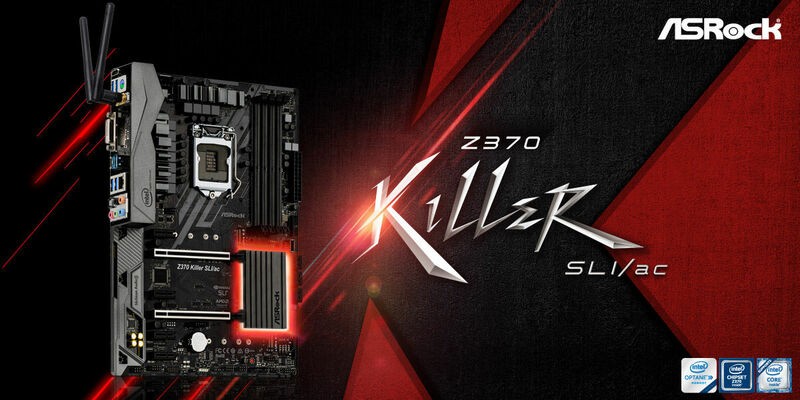 And now the Z370 Killer SLI continues that tradition by offering the best CPU power solution in its class, with 10 phase power, as well as a USB3.1 Gen1 Type-C front header, and 2x Ultra M.2 to provide super-fast PCIe Gen3 x4 speed for SSDs, also with the cool new design, the black and gray PCB artwork gives the motherboard a striking but classy feel. Of course, while high-end users get all the attention, every user wants performance and stability. In fact, ASRock has always been the perfect solution for mainstream users, and continues to offer these users a great blend of computing performance, graphics power and amazing stability, even bringing 10 phase power design to the Z370 Pro4 and Z370M Pro4 series motherboards, which represents the best power solution available from any of the companies competing in this market. 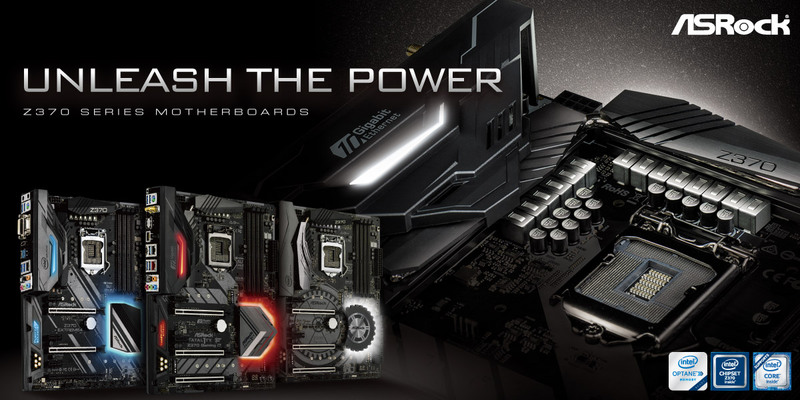 With this new line up of ten unique Z370 series motherboards, ASRock is now able to offer the best solution across the board for all of the 8th Generation Intel® Core™ Processors. In fact, with this new motherboard series, ASRock is today redefining how a stable and powerful motherboard should be built. 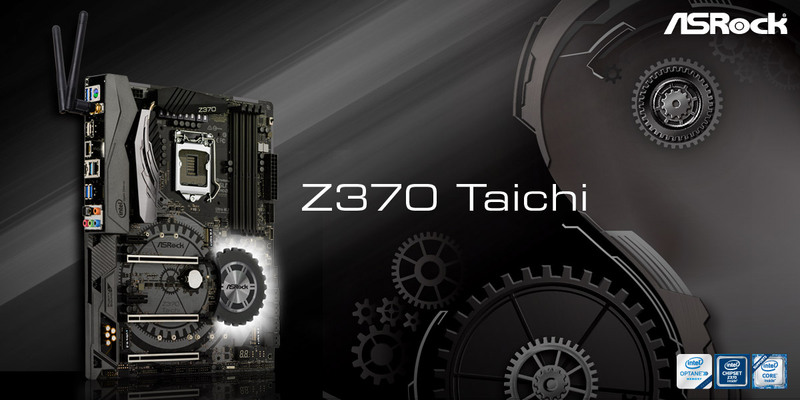 ASRock’s Z370 motherboards are available in ATX, mATX and mITX platforms, with boards for users from the mainstream up to high end gamers and enthusiasts. This entry was posted in Gaming and tagged 10Gb/s Ethernet, 8th Generation, Aquantia, Asrock, Extreme, Fatal1ty, Gaming, Intel Optane, Intel Z370, new, RGB LED, Socket 1151, Taichi, Workstation. Bookmark the permalink.